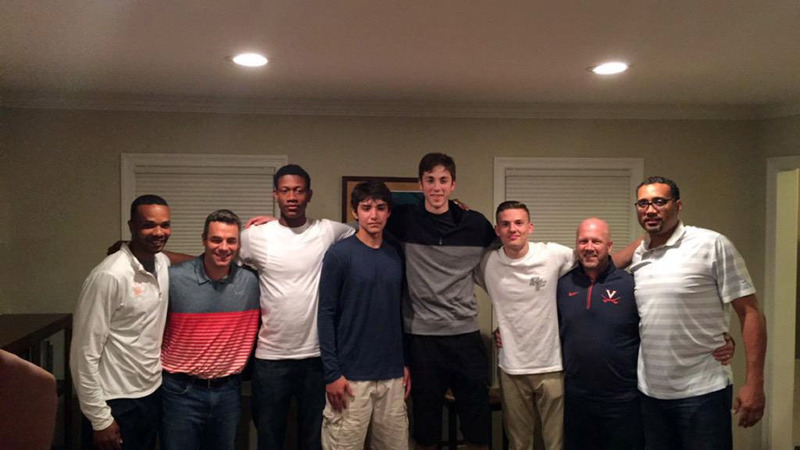 Hunter, third from the left, tweeted this photo the night he committed to UVa. (Photo courtesy of Hunter’s twitter account). DeAndre Hunter was looking to “find the right fit” when figuring out where he wanted to spend his college career. On an unofficial visit in early August, the Friends’ Central (Wynnewood, PA) senior small forward prospect felt the University of Virginia might be the place he was looking for. Hunter returned to Charlottesville this past weekend, and the official visit he made confirmed his initial feelings. This past Saturday, the consensus 4-star recruit made the call for the Cavaliers. Hunter was accompanied by his mother on the unofficial in August. This past weekend, his older brother, Aaron, made the trip.